"using alcoholic or malt liquors as a beverage, and to discourage the use and sale of the same in all honorable ways." Art. 5 - Each member shall be assessed the sum of twenty five cents on the first Saturdays of July, January, October and April, payable to the Treasurer. Art. 6- The regular meetings of this union shall be held every Saturday night. Special meetings may be called by the board of directors. Art. 7 - No sectarian or political subject shall be discussed at any meeting of this union. Art. 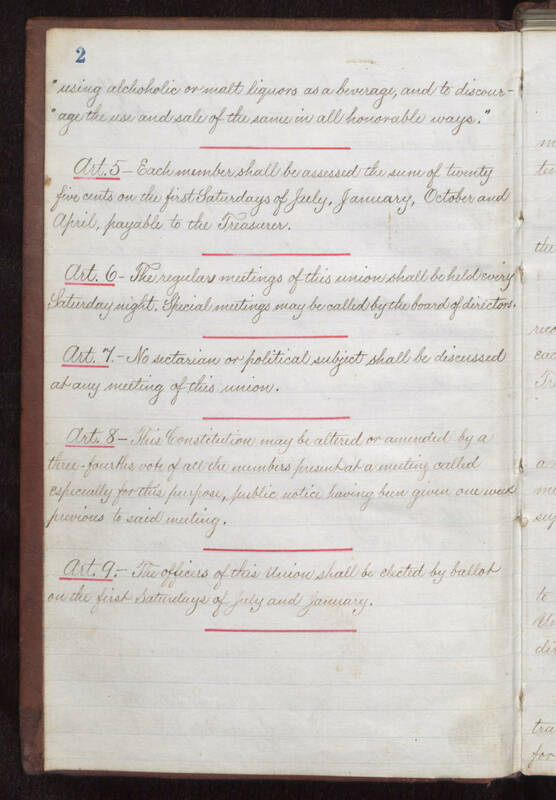 8- This constitution may be altered or amended by a three-fourths vote of all the members present at a meeting called especially for this purpose, public notice having been given one week previous to said meeting. Art. 9- The officers of this Union shall be elected by ballot on the first Saturdays of July and January.